All they had to do then was make history by drafting them, then figure out how to get them out. That’s when the Wings turned to Keith Gave, the newsman whose clandestine mission to Helsinki, Finland, was the first phase of a of a years-long series of secret meetings from posh hotel rooms to remote forests around Europe to orchestrate their unlawful departures from the Soviet Union. One defection created an international incident and made global headlines. Another player faked cancer, thanks to the Wings’ extravagant bribes to Russian doctors, including a big American car. Another player who wasn’t quite ready to leave yet felt like he was being kidnapped by an unscrupulous agent. Two others were outcast when they stood up publicly against the Soviet regime, winning their freedom to play in the NHL only after years of struggle. 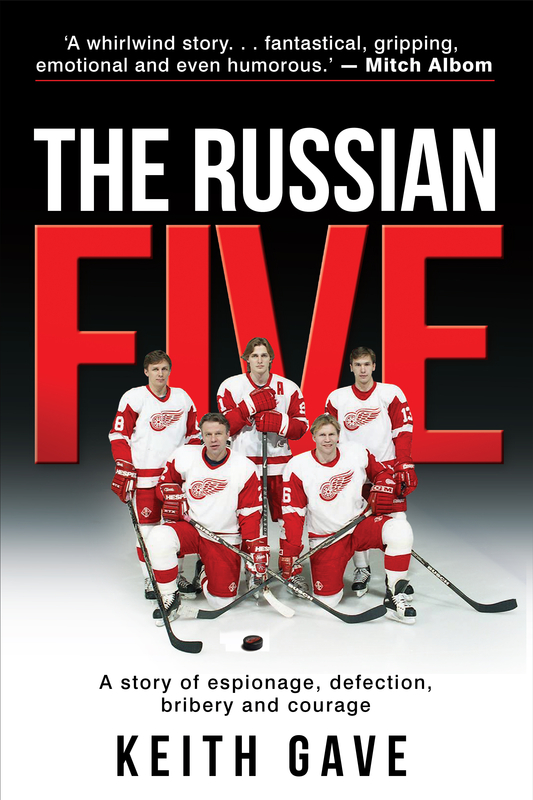 They are the Russian Five: Sergei Fedorov, Viacheslav Fetisov, Vladimir Konstantinov, Vyacheslav Kozlov and Igor Larionov. Their individual stories read like pulse-pounding spy novels. The story that unfolded after they were brought together in Detroit by the masterful coach Scotty Bowman is unforgettable. This story includes details never before revealed, and by the man who was there every step of the way – from the day Detroit drafted its first two Soviets in 1989 until they raised the Stanley Cup in 1997, then took it to Moscow for a victory lap around Red Square and the Kremlin. The Russian Five did more to bridge Russian and American relations than decades of diplomacy and détente between the White House and the Kremlin. This is their story. Keith Gave spent six years in the United States Army as a Russian linguist working for the National Security Agency during the Cold War. Nothing could have better prepared him for a career as a sports writer covering hockey for the Detroit Free Press. His 15 years with the newspaper were the highlight of a career spanning nearly four decades in the news industry. He also served as writer/producer for the soon-to-be-released documentary film, “The Russian Five.” He lives in Roscommon, Michigan, where he continues to write when he’s not sneaking off to cast a fly to the trout on his home waters of the Au Sable River.